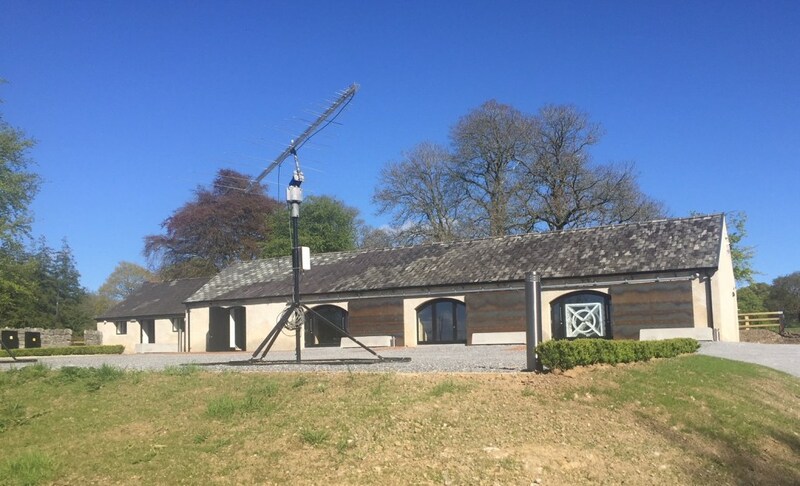 On June 5, 2018 we completed the refurbishment of our new I-LOFAR Education Centre & Control Room at the Rosse Observatory, Birr Castle, Co. Offaly. The Education Centre will be used to host groups of school children, university students, researchers, and tour groups interested in learning about the fascinating science and engineering of I-LOFAR. The Control Room contains computers to control I-LOFAR remotely and to processes the huge volumes of data that the array generates. We’ve come a long way from the “Sheep Shed Control Room”! We’re on the road to LOFAR … come on inside. Groups or schools wishing to visit I-LOFAR can contact the reception at Birr Castle Gardens & Science Centre. The refurbishment was carried out by building contracts Bracken & Sons (Offaly), Cooney Architects, consultant engineers Fitzsimhttps://i1.wp.com/lofar.ie/wp-content/uploads/2018/05/Education-Centre-Final.jpeg?fit=1030%2C626ons, Doyle & Associates, and project managed by Trinity College Dublin Estates & Facilities. Funding for the project has been provided by the Rural Economic Development Zone (REDZ), Department of Culture, Heritage and the Gaeltacht, supported by Offaly County Council and the Offaly Local Enterprise Office. The I-LOFAR Education Centre (June 2018). TCD’s Joe McCauley and Eoin Carley in the I-LOFAR Control Room (June 2018). The Mt. Palmer Barn (January 2014). What a mess! “The Sheep Shed Control Room” (July 2010). The sheep are now long gone! Meath footballer Cillian O’Sullivan has welcomed the green light to redevelop their Páirc Tailteann GAA base, describing it as “long overdue”. Meath clubs have confirmed their support for the construction of a new 21,000 capacity all-seater stadium on the existing Brews Hill site in Navan. It follows the granting of planning permission for redevelopment and a passionate plea from four-times All-Ireland winning football manager Sean Boylan for clubs to back the project. Meath GAA has confirmed that they will establish a Páirc Tailteann Development Committee that will attempt to raise €2m in the next two years. Meath clubs are already repaying levies for construction of the county’s Dunganny training centre and have agreed an “additional levy be introduced initially for seven years”. In the case of a senior club in Meath, payments would increase by €1,000 to €2,500. Boylan told club delegates on Monday night that “the GAA needs a really big and really good stadium in north Leinster and I believe it should be Páirc Tailteann”. O’Sullivan, Meath’s influential attacker who will feature in Sunday’s important Division 2 tie against Cavan, agreed that an upgrade is necessary. “It’s long overdue,” said O’Sullivan. It’s understood that phase one of the project will be the completion of a 4,000 capacity all-seater stand at a cost of €10m with construction on this hoped to begin in early 2019. We really enjoyed the talk by Bjarke Ingels (B.I.G.) organised by Irish Architecture Foundation. This article was published in Architects’ Journal BY ELLA JESSEL in APRIL 5th, 2018. The globe-shaped structure will be a 18,000-capacity music and entertainment venue for MSG Ventures, the firm behind New York’s Madison Square Garden arena. MSG has already purchased a 2ha site in Stratford near the Olympic Park for its London Sphere, its first international venue, and a sister arena in Las Vegas is also in the pipeline. The visualisations reveal that the venue’s exterior will be covered with programmable digital screens to showcase artistes and brands. MSG said its interior will boast the ‘largest and highest-resolution media display on Earth’ as well ‘crystal-clear acoustics’. Further details of the design are to be announced in the coming months and the company hopes to submit a planning application by the end of 2018. The visualisations were unveiled at an event at the Copper Box Arena in Stratford’s Queen Elizabeth Olympic Park. PNC Park debuted 15 years ago this spring, and while that may not seem like a major-league accomplishment, consider this: When Three Rivers Stadium turned 15, it was halfway to being imploded. The Pirates’ current home couldn’t seem further from such a dusty fate. PNC Park still is thought to be one of the best ballparks in America, even though nine stadiums have opened since the North Shore park’s first regular season game April 9, 2001. While all three of Pittsburgh’s professional stadiums opened within a decade, PNC Park seems to soar above the rest, a symbol of the city’s rise and a source of pride for its baseball fans. Architecture firm HOK (now called Populous), which designed PNC Park, drew upon Pittsburgh’s natural resources and manmade features, particularly in orienting the ballpark toward its signature view of the city’s skyline and bridges. The designers also took hints from the city, particularly beloved Forbes Field, the predecessor to Three Rivers Stadium. They also envisioned the North Shore and the classic ballpark as lively extensions of Downtown via the Roberto Clemente Bridge, a fate that has borne out. The design team’s focus on gathering spaces in and around the stadium has transformed the park and its surrounding streets into an anchor of activity on the North Shore. With two decks rather than three, PNC Park was able to maintain a feeling of intimacy, even though it is larger, in terms of square footage, than Three Rivers Stadium. Clad in cream-colored limestone and blue steel, it was the first double-decker ballpark built since 1953. In 2003, ESPN.com ranked PNC Park as the best stadium in Major League Baseball. “When building a stadium, most teams just look at the most recent new one and say that they want one just like it, only bigger and more expensive,” ESPN’s Jim Caple wrote of the surprise winner. “Not Pittsburgh. The Pirates and the public built a stadium that is not only located in Pittsburgh but one that is part of Pittsburgh. But as the North Shore ballpark celebrates its quinceañera, it is worth remembering how improbable the project seemed. “It’s like any deal that, by hindsight, seems successful and exciting. You forget the number of times the deal almost failed to get done,” Newlin said. In 1993, the owners of the Pirates told newly elected Mayor Tom Murphy of their intent to sell the team. A clause in the contract allowed the city, which feared the team would end up elsewhere, to try to secure new, local ownership. But MLB would not permit the sale to a group led by Kevin McClatchy unless the Pirates had a new stadium — one that would not be shared with another sport, as had been true of the football-baseball mashup at Three Rivers Stadium. The Steelers and the hotel industry argued that they, too, needed a new football stadium and convention center. So what started as an effort to keep the Pirates in Pittsburgh turned into a major redevelopment project for the region. Fresh in Pittsburghers’ memory was the downward economic spiral of the 1970s and 1980s, when Western Pennsylvania was losing residents by the tens of thousands, businesses were getting out as fast as they could and Pittsburgh had dived face-first into double-digit unemployment. And now, this new mayor was trying to build a new ballpark in a broke city that couldn’t pave the roads? “To say the least, it was not popular at the time,” Murphy said. The leaders, however, saw the ballpark as a way to turn around Pittsburgh’s fortunes, and worried about the symbolic and economic impact of the Pirates’ potential departure. “It was a fundamental decision about whether Pittsburgh was going to continue to decline or we are going to reach forward as a city,” Murphy said. After two years of construction and a $262 million pricetag, PNC Park staged its first regular season game in April 2001. Fifteen years after Murphy, Newlin and others fulfilled their promise, few Pittsburghers would argue that PNC Park wasn’t worth the effort. Fans pack the PNC Park rotunda on October 7, 2015 for the National League Wild Card Game. Leanne Kiernan, Irish international soccer player( who is from Bailieborough) with the Cooney Architects designed Campus Conference Centre at Abbotstown in the background. Kilmainham office is our most recently completed project. The front facade casts dramatic shadows internally. Brook House, Thomastown, Co. Kilkenny, a new community of 5 homes, carved into a steeply sloping medieval street. Once home to the towns tannery master, has been transformed into a new community. The historic house has been carefully conserved and restored. The addition of a modern 21st century layer has been folded into its complex urban fabric, which reveals itself as you pass under the historic medieval archway. A new textured concrete canopy protects and echoes to the beat of its historic waterway. The central courtyard, the heart of this community, provides a space for its residents to flourish.